The Center for Irrigation Technology is involved in more than just irrigation product testing, certification and applied research. Since 2002, CIT has managed the Advanced Pumping Efficiency Program (APEP) for Pacific Gas and Electric Company. APEP is an incentive program intended to improve overall pumping efficiency and encourage energy conservation in California. 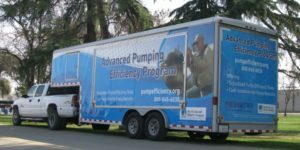 From 2002 through 2015 (as of 4/30/15) CIT has operated APEP with funding from the California Public Utilities Commission (CPUC) and provided California water pumpers with: 2,167 pump retrofit/repair rebates; approximately $12,000,000 in incentive rebates for those projects; 138,800,000 kilowatt-hours saved annually as a result of those projects; 373,000 therms saved annually as a result of those projects; 35,404 subsidized pump efficiency tests (approximately $5,000,000 in subsidies); and 175 educational seminars. APEP is available through Pacific Gas and Electric Company’s Customer Energy Efficiency offerings, funded through the Public Purpose Programs Charge under the auspices of the CPUC. This is a fee paid by all accounts of the major investor-owned utilities in California including PG&E, Southern California Edison Company, Southern California Gas Company, and San Diego Gas and Electric Company. The purpose of this fee is to fund activities that improve energy efficiency and promote energy conservation. APEP has funding currently authorized through December 31, 2017 however, the program has a limited budget and may be terminated or modified without notice. Requests for pump efficiency tests or applications for an incentive for a pump retrofit/replacement are accepted on a first-come, first-served basis until available funds are allocated or the end of the program, whichever comes first. Check the APEP website at www.pumpefficiency.org or call APEP toll-free at (800) 845-6038 for up-to-date information.